Recently I had the opportunity to work with a couple who had very specific needs for their family. This family included not just their children, but their pets as well. I'm sure it will come as no surprise to those of you who have pets, but the needs of our pets weigh fairly heavily on our home buying decision. Some of the more common requests I get are things like the obvious... a fenced in yard. Having a fenced in yard lets your pet have free roam of the backyard while also reducing your liability of an unfortunate interaction with the pet and someone else. It also protects the pet from wandering off into the road and roaming too far away from the house. I've also gotten requests for screened in porches so cats can be outdoor, but NOT outdoor. Outside of screened in porches and fences, the most common modification I see for homes with pets are "doggie doors" or pet doors since some cats do use them. When I asked a few friends on Facebook for some other criteria that they used when buying their home I was surprised to hear that having carpet on the steps was something important to them. After thinking about it, it totally makes sense! But not something I would have thought about. 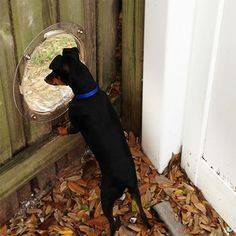 Have you seen the "Pet Peeks" that are basically windows in fences so the pets can see out? There is one in an adjacent neighborhood that I walk by all the time and again, something that makes a lot of sense, but I wouldn't have thought of. A common request for people with children is that one of the bathrooms have a tub, not just a shower. This same request follows for people with large dogs as well, and people with smaller animals typically want a utility sink in the laundry room to help with bathing. Some homes are even built with pet washing stations built into the laundry rooms. Geographic location can also play a part in the home selection. One of the more popular dog parks in Louisville is located in EP Tom Sawyer Park. Subdivisions like Indian Springs that are located nearby have an advantage. Some neighborhoods like Norton Commons have dog parks inside the subdivision as a community amenity. Sound off in the comments section below. What criteria did your pet(s) influence in your last home purchase? In closing I leave you with a video by Lucy -- who obviously believes that if there is a will there is a way.